Beloved, our Father God watches over you and me. His heart is tuned in to our cries, He hears the deep anguish of our spirit, He sees the burdens and wounds our hearts carry…. 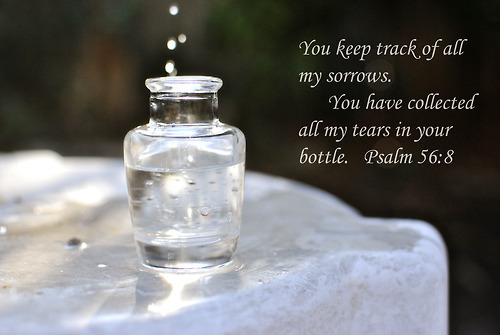 Our tears are precious to Him, stirring His very heart causing Him to respond to our tears. There will come a day when our Heavenly Father will come for His children. He will embrace us in His comforting arms and He will forever wipe all our tears away . And I wonder, will He show us those bottles of tears He has been collecting? My friends, do you know that our tears speak a special language to the very heart of God….. He loves you….He loves you….He loves you…. so let the tears flow… and know that our Father God cares for you intimately and with great passion beloved…. Hi everyone, this is just a quick post to let you know that I am now “tweeting” on Twitter. You may be wondering why I chose to go this route as well as my blog and the reason is mostly because I don’t always get the time to post on the blog but I can usually manage to share a sentence or two….so, I decided to use the micro-blogging platform, Twitter. As the Spirit leads I will continue post some blogs. My heart is still, and always will be, for those wounded by abuse because abuse often leaves us with a broken heart and a wounded spirit. Through “tweeting” my desire is to continue to offer words of life, encouragement and hope….and my prayer is that through what I share, both here and twitter that Christ would bring comfort and healing….. through Him the broken hearted can find healing!! The snow had fallen all night and then all morning with big, fluffy flakes. Finally late this morning the sun made its presence known. As I sat at my kitchen table gazing out at the vast, glistening snow covered fields, with a pot of warm tea steeping close by, a candle softly adding a bit of warmth and glow, I was awed by the promise found in Isaiah 7:14 “the Lord himself will give you the sign. Look! The virgin will conceive a child! She will give birth to a son and will call him Immanuel (which means ‘God is with us’). God is with us…as I meditated on this one little line I felt the presence and comfort of the Holy Spirit. And as I was lost in the brilliance and splendor of the sun glistening on the snow like diamonds, I felt comforted. But even as I sat in my warm, comfortable home, surrounded by the things I love I realized that of all the comforts I find in this world, the greatest comfort I can have is in the presence of Jesus Christ. 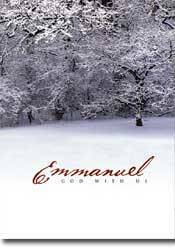 The prophet Isaiah described this presence as, “Immanuel, God with us.” Today, whenever I would think of this phrase, “God with us,” I was reminded that no matter what I’ve been through, or whatever trials may come my way in the future, or even the fact that I am alone for a time while my husband is away, I am not alone…God is with me!! The very One who created the world, the One who holds the heavens in his hands, the One who establishes kingdoms and destroys armies…..He is in me and around me….He surrounds me with His protection, comfort and love. He is my shield, my fortress…He is my security, refuge and strength, He offers me His compassion, care, and deep abiding love. He is with me!! And then an interesting thing happened….you’ve heard of the calm before the storm, well that is what happened here this morning. Suddenly a wind came up so strong that I could barely make out the neighbors house and for the rest of the day a blizzard raged across the prairie. I live in the country and one of the ways we help supplement our heat is with an outdoor wood boiler….to make a long story short it sprung a leak and all the antifreeze drained out of it. I could no longer use it as my main heating source. Plus, every winter my husbands work takes him away for a couple of months and he left just this past week….so here I am alone, with a major problem and I have no idea how to fix it, but God is good, and I am blessed with awesome neighbors who came to give me a hand. After a couple of hours I was tucked safely back in my warm home. May you hold His promise close to your heart today~God is with us!!! For several months I’ve understood that I have an assignment from God and that assignment is to grow in compassion. To understand His great love for me and to accept it. Partly due to the assignment itself I have fallen back into a relapse of self-injury and the obsession and humiliation that goes along with it. I think coming face to face with the compassion void in my life brought me right to the heart of the painful wound I have suffered since before I can remember. I’m posting that story here a little bit at a time (I’m about half way through) in the category called ‘A Farewell to Shame’. So the painful truth is that no one cared about what I suffered. No one rescued me. No one brought justice. Not my family, not my school, not my doctors, and not even my church. I’ve been working for a while now trying to understand better what I need to do and to ask God to make clear the path that I can follow to Him. Last Thursday night in the middle of the night I woke up suddenly. Throughout most of my life I’ve struggled with nightmares/flashbacks of trauma that interfere with my sleep. I woke up and felt a sense of warfare and the need to pray. At that time I had one of the most amazing experiences of my life. An encounter with God. I suddenly felt His presence in the room. As I was lying there in my bed on my side with my hands in front of me I felt God’s presence come along beside me. He put his arms over my arms and held me — surrounded and embraced me. Now I’m an old married woman and in the 16 years I’ve been married I’ve received literally thousands of hugs but no human embrace has ever soothed and satisfied my soul the way this experience did. In my pain/suffering/trauma I always feel the pain focused in the pit of my stomach. The feeling of a raw open wound deep in the center of my abdomen, located there but not physically there. While I was lying in my bed with God’s arms around me I felt a warm explosion exactly at that spot inside me. A feeling of peace and healing washed over me and I felt fully at rest. But that wasn’t all, next I felt a strong heaviness and warmth on the backs of my hands. They felt so warm and heavy that I couldn’t lift them if I tried but I didn’t want to move but just lie there and feel it. Since that night I’ve been given a way out of the obsession of self-injury. When I’m pulled and drawn to raise my hand to injure myself I turn my hand over and with the back of my hand I use the Father’s touch to stroke and soothe my face. I think about His compassion for me and how He suffered with me in what I suffered just as I suffer with Him in what He suffered on the cross. It’s so raw and so personal and so childlike that it’s hard for me to write these words but I want to share and spread hope because I know what it feels like to struggle and I know I’m not the only one. There’s one more thing. I have ‘quit’ many times. More times than I can count. Each time I strongly resolve never to go near this sin again. I remind myself that I’ve been healed and cured and that there’s no need to ever fail again. Then each time I’ve been tempted and each time I’ve stumbled and relapsed I’ve felt such intense shame. I doubted that what deliverance God brought was real and I’ve felt that His efforts were wasted on me because I so quickly forgot His help. I’ve even been angry that He didn’t stop me from falling again so quickly into sin. That if there was a way out I didn’t see it and didn’t take it so either God was blowing it or I was blowing it and either way I was lost. This time is so different. I have made no pledge, no promise, no threat to myself that I will never hurt myself again. God has shown me that He will LET me do it again — He will not stop me or distract me or control me. And that’s not to say that He doesn’t care what I do — He cares very deeply about everything I do. But I have a choice. I can choose to sin. Each time I want to sin I can use it as a chance to experience His compassion and be reminded of His love. He won’t take away that desire, it will always be a part of me. But if I fail He won’t turn His face away from me. He’ll give me another chance — as many as I need. So thank you for reading this long post. I hope someone understands what I’m trying to say and I hope someone here finds the courage to walk another day in the light of God’s love.